Is there a way to get the IMEI number from Xamarin Forms app? Here you can get the ID. @YkshLeo So am I right in saying if we use the iOS solution the app will get rejected? Accoding to your above link,DeviceId(IMEI) and AndroidId are two different things? 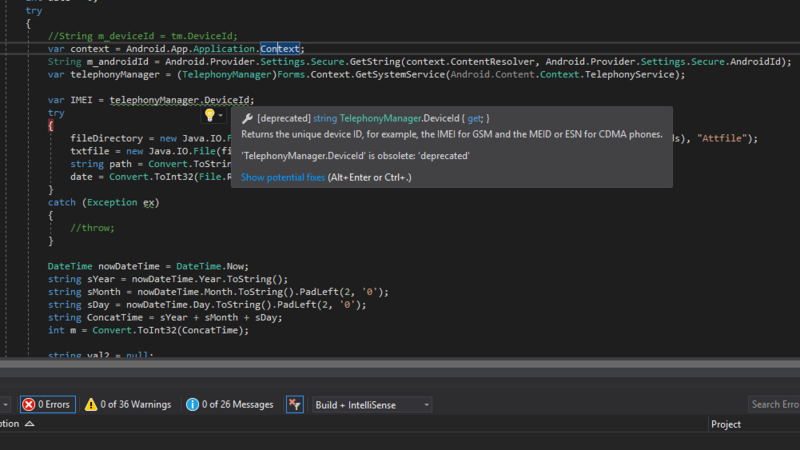 So,how to find out DeviceId(IMEI) of phone using Dependency Services in Xamarin.Forms? i tried using above code but TELEPHONY_SERVICE is giving compile time error? This is how you implement it. I read here http://stackoverflow.com/questions/41356332/how-can-i-get-android-and-iphone-imei-number-using-xamarin-forms that since ios7 reading the imei wont pass the app store? I get a hex string value like "70eab036c06faf7", is not the corect IMEI ! do i have to convert them ? The AndroidID is also an unique ID, but unfortunately not the IMEI (and it also can't be converted to the "real" IME! Also the ACR.DeviceInfo plugin seems to return the AndroidID (instead of thee IMEI). The only way, I found, is over the telefonyManager and that needs the "bad" right READ_PHONE_STATE, that you have to handle your own in your app (thanks to changes in Android marshmallow (Android 6). I have a shared .forms (3.1) App (whereby I only use the Android App yet) and have implemented the code below. The code works, but the App then needs in adition the right READ_PHONE_STATE, that you have to handle completely yourself in your app. As a correct and user-friendly handling is not easy to implement and needs a lot of additional effort, I dont use that for now (as I don't need it mandatory yet). // Needs Right READ_PHONE_STATE !! (else the app will crash) and you have to handle the rights in your app! @FredyWenger It shows an error . I've attached the screenshot. How can I resolve this problem ??? @JamesLavery Yeah It's working. Thanks for your help.